Three years ago, Lutron was one of the first vendors to venture into the HomeKit ecosystem with its Caséta Wireless lighting controls, which include plug-in lamp dimmers, wall-mounted dimmer switches, and remotes, all coordinated through a wireless "Smart Bridge" that plugs into your internet router. The Caséta system has been such a mainstay in the HomeKit world that Apple is still selling it in its stores, including a $100 starter kit with a smart bridge, an in-wall switch, and a Pico remote control. Additional sets of one in-wall dimmer and one remote are available for $60 each. A host of other lighting switches and Pico remotes are also available to satisfy a range of needs, and the entire system is very popular with our readers. Beyond lighting, the Caséta system also integrates with other products, including several styles of automatic HomeKit window shades from Lutron, as well as a joint Lutron-Honeywell thermostat and even some ceiling fans from Hunter. In addition to HomeKit, Caséta also integrates with Amazon Alexa, Google Assistant, Samsung SmartThings, and Nest, as well as Sonos, Carrier, ecobee, Logitech, and Xfinity Home. 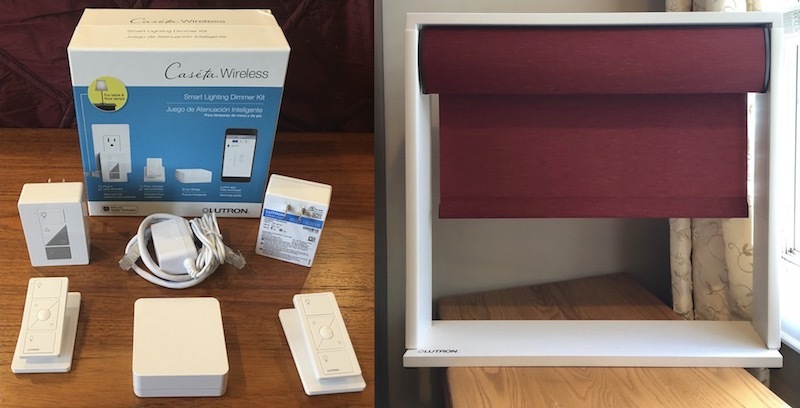 I've had the Caséta lamp dimmer system controlling the bedside lamps in my master bedroom for quite some time, and Lutron also sent along a demo setup of the company's battery-operated Serena shades to see how the different products integrate both within the Lutron app and through HomeKit. Serena shades are available in roller, single honeycomb, and double honeycomb styles in over 150 fabric and color options with a variety of opacities. Lutron's higher-end Sivoia QS Triathlon shades intended more for professional home automation setups will also integrate with the Caséta system and HomeKit. Each Caséta lamp dimmer plugs directly into an electrical outlet and has its own pair of outlets to control up to two lamps simultaneously. In order to control the lamps on either side of our bed independently, I needed to use both dimmer units included in the starter pack Lutron sent me. There are large buttons on the face of each lamp dimmer to control brightness level or immediately turn connected lamps on or off. But given that the dimmer is frequently plugged into an outlet low on the wall or even tucked away in an inaccessible location such as behind or under a bed as in my situation, the Pico remote is key for manual control of lamps. 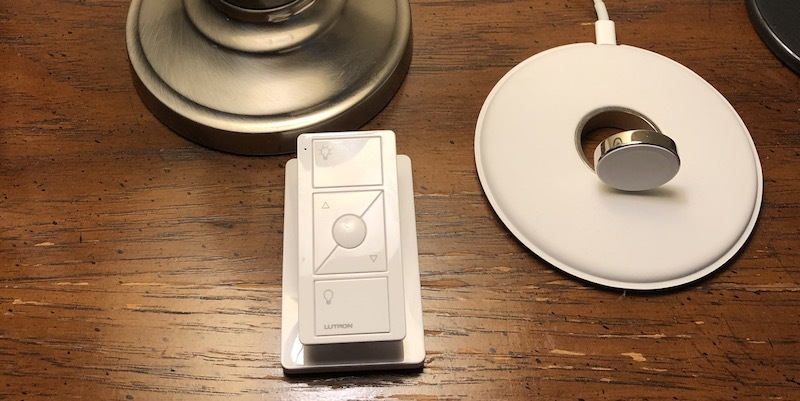 Setup of Caséta products is fairly simple, but it's important to note that these devices utilize a separate Smart Bridge accessory to connect to each other, the Lutron app, and HomeKit. 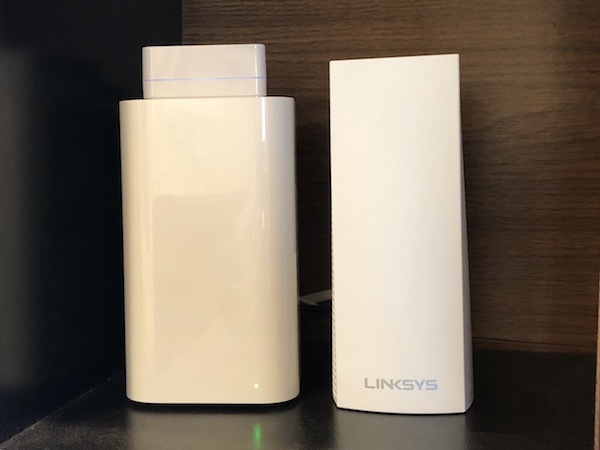 The Smart Bridge is a small white box that connects over an Ethernet cable to your router. It's one more thing taking up space and an electrical outlet, but it's not an uncommon move used by manufacturers to bring HomeKit support to connected products, particularly since Apple has only just recently started allowing for software HomeKit authentication. Once your Smart Bridge is online, the Lutron app will walk you through the setup for each of your products. If you're using a Pico remote, you'll need to set that up separately, but it's a simple process. For a lamp dimmer, just hold down on the bottom button until the LED flashes, and then the app will prompt you to assign it to a room and specify what kind of fixture it will be controlling. From there, you can easily rename the device and then go through a similar short setup process for the Pico remote associated with each dimmer. If you're using in-wall switches, setup is similar, although you'll obviously have a bit more work to do on the installation side to swap out your existing switches for the Caséta ones. I wasn't able to experience the full installation process for the Serena shades considering I was using a prepackaged demo unit, but once they are mounted, it's an easy process to install the six D batteries and walk through the usual setup in the app. One interesting feature of the lamp dimmer kit is that one of the dimmers can be used as a range extender, increasing the range of the Smart Bridge network by up to 30 feet. It can come in handy if you have Caséta devices at the opposite end of your house from the Smart Bridge, with a Caséta dimmer somewhere in the middle helping boost the signal to make sure everything can communicate properly with the bridge. 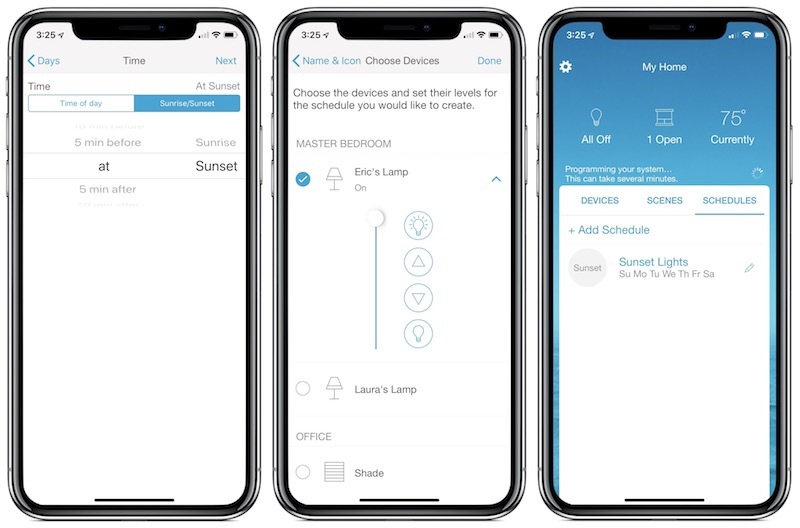 While the Caséta ecosystem integrates with HomeKit, the Lutron app isn't a full replacement for Apple's Home app, so you can't see all of your HomeKit devices in it. You can, however, manage all of the Caséta and Lutron shade products as well as thermostats from Honeywell, Carrier, ecobee, and Nest. Sonos speaker systems can also be integrated within the Lutron app. 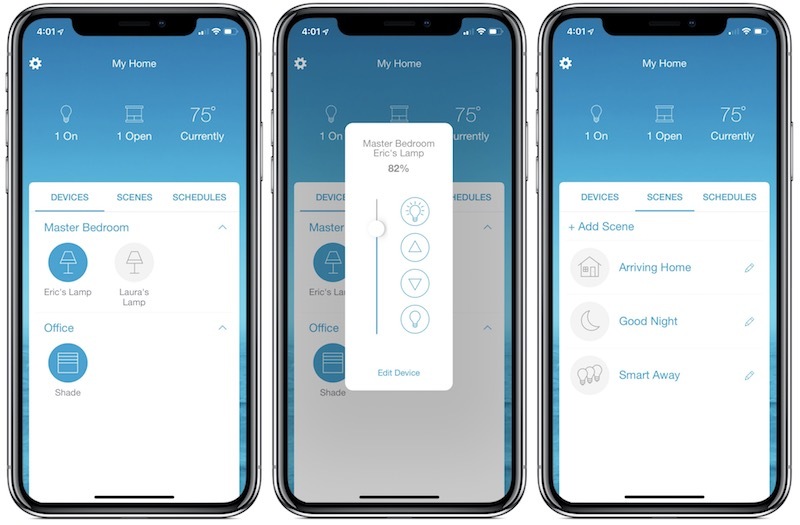 The Lutron app offers quick access to all of your Caséta-compatible products, and tapping on individual devices in the app pops up a set of controls with buttons similar to those seen on the device itself or the Pico remote. For example, with the lamp dimmers, you'll get options to turn the lights on or off, or adjust the brightness. Brightness can also be adjusted using a slider. Both the lamp dimmer/shade and the Pico remotes that control them show up individually by default, which can be a bit confusing considering they really do the same thing, but there's an option in settings to hide remotes from showing on the main screen. Controls are a similar story with the shades, which you let you tap into the app to open or close them all the way, go to a preset "favorite" level, or manually adjust up or down with buttons or a slider. More power comes in the form of scenes, which allow you to combine Caséta-compatible devices under a single command. For example, a "Good Night" scene could turn off all of the connected lamps and light switches around your house, lower the shades, and adjust the thermostat. 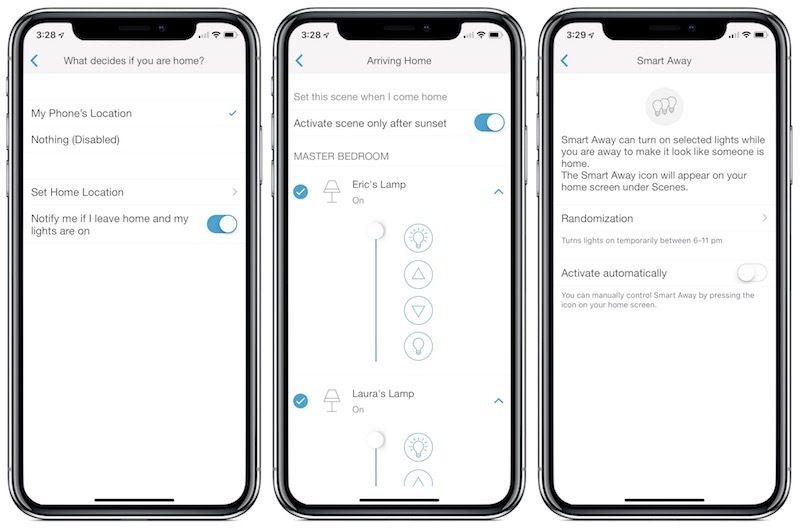 These function essentially the same as scenes in HomeKit, but it's important to note that these are not actually the same thing – a scene set up in the Lutron app will not appear in the Home app. Lutron scenes can be controlled not only from within the app itself but also through a Today widget. You can customize which scenes appear in the widget and then easily access the controls at a swipe. Lutron also includes an Apple Watch app that gives you quick access to scenes and individual devices right from your wrist. There does appear to be some limited ability in the Lutron app to interact with HomeKit devices that aren't officially supported, as my Emerson Sensi thermostat shows up on the main screen and I can adjust the temperature set point and heating/cooling modes within the Lutron app. Other HomeKit devices around my house do not, however, appear in the Lutron app. In addition to manual control of Lutron-based scenes, you can also set up schedules for individual Caséta devices or combinations of them. Schedules can be customized by day of the week and set using either absolute times of the day or relative to sunrise or sunset. Lutron also offers some geofencing features, allowing you to set a custom radius (1000 feet by default) that will trigger certain events when you are coming or going. The app can remind you if lights have been left on when you leave the radius, and you can set certain lights to turn on as you arrive home or turn off as you leave, for example. A toggle option lets you set whether or not the scenes activate only after sunset. The geofencing also extends to a feature Lutron calls "Smart Away," which can randomly turn certain lights on and off between 6 PM and 11 PM when you're away from home in order to make your home appear occupied. The geofencing feature can activate Smart Away automatically when you leave home, or you can opt to turn Smart Away on manually as a scene from the app or Today widget. Manual control for smart home accessories is a key feature, as not everyone coming into your home is going to be set up to control your lights and other accessories through their phones, and Lutron's Pico remote does a great job at managing that aspect of operation. The Pico remote can be held in the hand or slid onto a pedestal stand (included in some kits, otherwise sold separately) that looks fairly fashionable and makes it easy to wirelessly control your lamps. Like the dimmer itself, the Pico remote includes separate buttons for on, off, and brightness adjustments. A center button can be configured to quickly set a lamp to a preset brightness level with one touch. 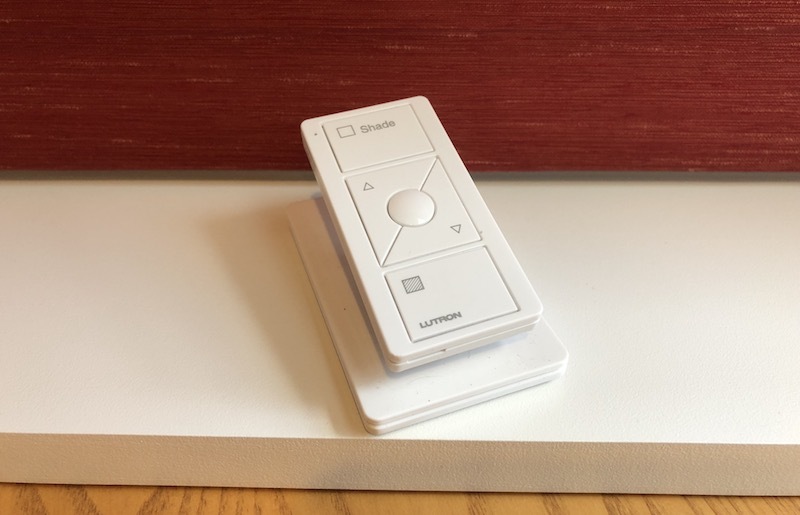 In addition to the included pedestal, Lutron sells other remote accessories separately, allowing you to mount a Pico remote to a wall like a standard switch or clip it to a car visor. 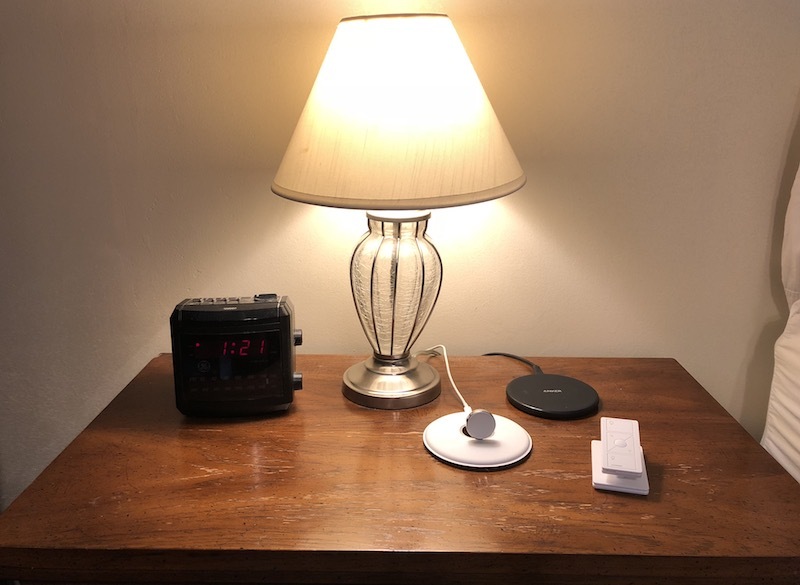 The Pico remotes for our bedside lamps typically sit on the nightstands next to the lamps, which allows for easy access to adjust the lighting level and turn the lamps on or off. But say you want to roll away from the lamp and you're feeling sleepy, maybe to read a book at bedtime with the lamp lighting your pages from behind over your shoulder — you can take the remote with you into your bed and turn the light off right from there as you're drifting off. 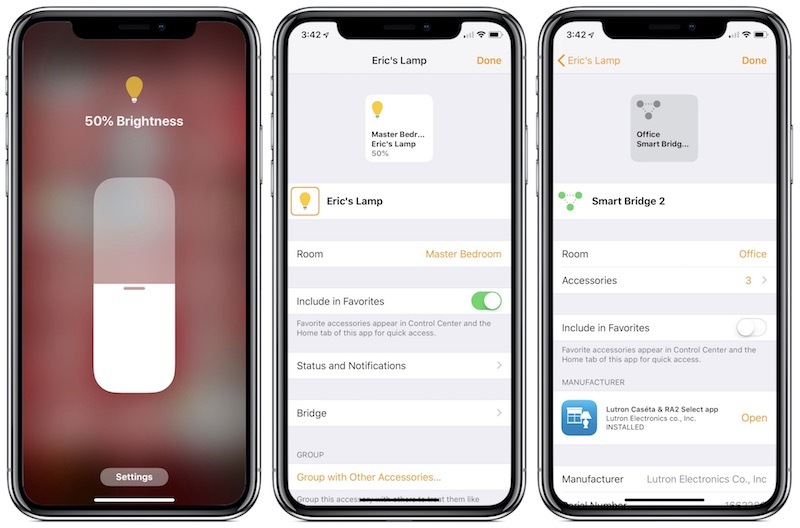 With app and HomeKit integration, you can of course also use your phone or Siri to turn off the lights, but that can be less convenient if you want to have your devices put away for the night and perhaps don't want to wake a sleeping partner by speaking to your lamps. The Serena shades also come with their own Pico remote, so you can similarly easily control the shades without needing to tap into any aspect of the smart home control. While they look very similar and can interchangeably slide onto pedestal accessories, Pico remotes are customized for each product so labeling and button functions on a shade remote are different than those on a lamp dimmer kit with no user configuration needed beyond the initial pairing. 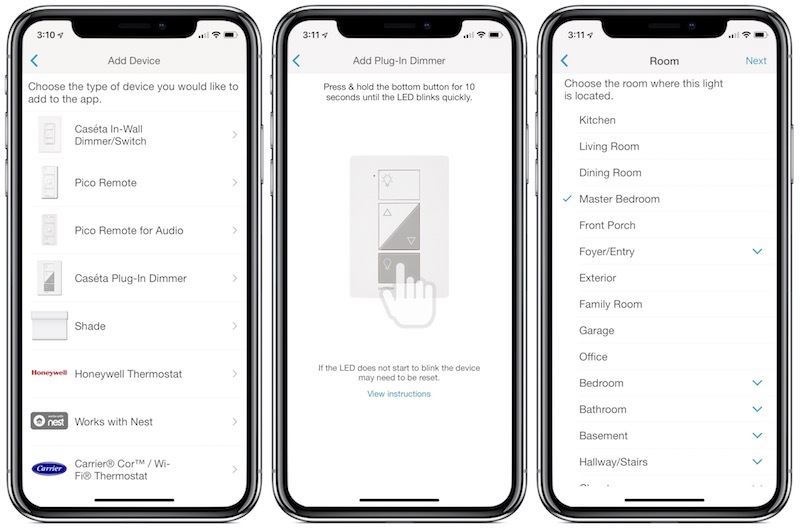 In addition to controlling things manually or through the Lutron app, once your products are set up you can also control them via HomeKit, which means the Home app on iOS (and soon macOS with macOS Mojave) or via Siri. 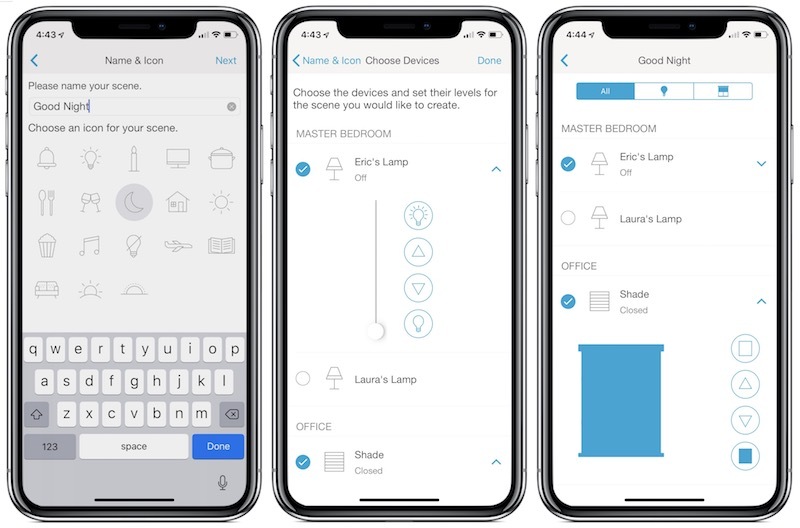 This opens up a host of other integrations, letting you add the Caséta dimmers and switches and Serena shades to rooms, scenes, and automations with other HomeKit products. Siri is especially convenient, allowing you to turn the lights on or off and open or close the shades by voice. 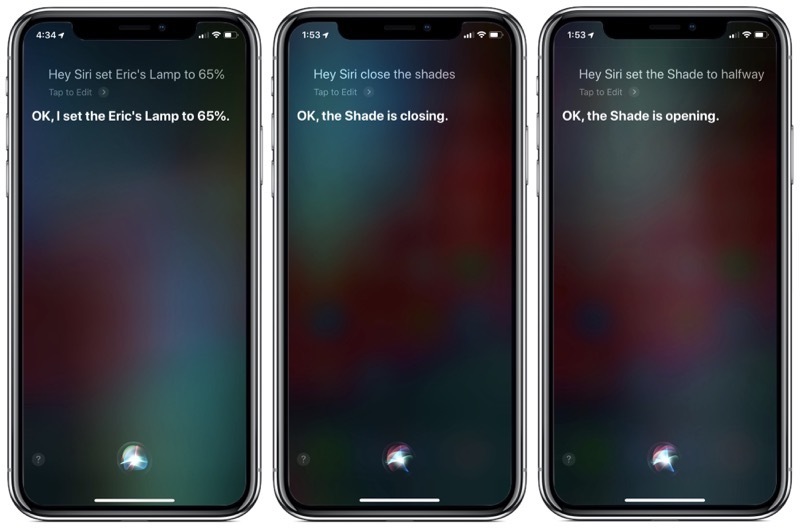 You can even use commands like "set the shades to halfway" or "turn on Eric's lamp to 50 percent" and the devices will quickly respond appropriately. Siri control works great with HomePod, which can hear you from across a room even while speaking quietly. As noted up top in the setup section, individual Caséta products are not directly compatible with HomeKit, as connectivity is managed through the Smart Bridge that attaches over a wired connection to your Internet router and then wirelessly to all of your Caséta devices. In practice, it doesn't alter the way these devices function with HomeKit, as they appear as separate devices in the Home and quickly respond to commands via the Home app and Siri. If you tap into the details on each Caséta product within the Home app, you'll see the Smart Bridge show up as a subpage, where you can see its information and remove it from your HomeKit home if necessary. Lutron has assembled a nice ecosystem of switches, dimmers, and even shades that work nicely together and with Apple's HomeKit system. The Caséta products are easy to set up and work consistently both through the Lutron app and through HomeKit. The Smart Bridge requirement adds an additional piece of equipment into the equation and likely increases the overall cost, but once it's up and running the bridge is essentially invisible in terms of operation and can be tucked away somewhat to minimize the visual aspect. As with most HomeKit devices, and smart home products in general, it's not cheap to completely outfit your home with the Caséta ecosystem. As noted up top, if you're looking for some in-wall switches, the starter kit with a switch and a Smart Bridge will set you back $100, with additional switches priced at $60, although you may find an occasional deal at another retailer to bring the cost down. Lutron offers a number of bundles in various combinations of accessories, so make sure to figure out what will work best for you. For example, the lamp dimmer bundle I've been using is priced at $190 and includes the Smart Bridge, two lamp dimmers, two Pico remotes, and two tabletop pedestals for the remotes. But you can also build a piecemeal system starting with a Smart Bridge for $80 and individual sets of dimmers or switches paired with Pico remotes (no pedestals included) for $50–$60 each, or omit the Pico remotes and save a few dollars. The full list of starter kits, individual products, and accessories is available on the Caséta Wireless website. Lutron also has an Amazon storefront for the Caséta ecosystem. Serena shades are custom manufactured based on your specifications, and pricing varies considerably depending on shade style, size, mounting method, fabric, and more, but expect to pay more than $400 (significantly more in some cases) per shade. It adds up quickly, but quality standard shades aren't necessarily cheap either, and many homeowners find the convenience of powered shades worth the cost, especially for window locations that are out of easy reach. Note: Lutron provided the Caséta lamp dimmer starter kit to MacRumors free of charge for the purposes of this review. The Serena shade demo unit was also provided free of charge and returned to Lutron at the conclusion of the review. No other compensation was received. MacRumors is an affiliate partner with Amazon and may earn commissions on purchases made through links in this article.